While, according to gerontologists’ calculations, human body biological resource amounts to nothing less than 120-150 years! So why the world's best health care systems cannot ensure our longevity? The point is that modern medicine, based on diseases treatment, in other words, the medicine of «repair», is almost exhausted, and recently the fact is noted by many authoritative experts. It is by no means possible to make an organ function properly if it has only 10-15% functioning properly cells left. Such organ just needs to be replaced. Treatment makes no sense! And while it is impossible we – at last! – have remembered that, instead of treating a developed disease, we can simply prevent it from developing or, at least, postpone it for quite a long time! We – at last! – have remembered that medicine has a section called «Preventive medicine», which aims not at already developed diseases treatment, but at identifying changes in the body that result in diseases development and at adoption of individual measures to prevent a disease from developing. Certainly, it was a kind of revolution when unique biomarker diagnostics of non- communicable diseases, that enables detecting a disease long before its clinical manifestation, was invented. Yesterday’s dream of seeing ‘disease before disease’ became our reality. It is now possible for the emergence of diabetes, heart and lung diseases and tumours to be anticipated, whilst pregnancy and childbirth complications can be prevented and even postvaccinal complications in children can be foreseen. The point 1 can be made only by you! If you don’t obey the healthy life style rules neither the best doctor nor the most perfect healthcare system in the world for any money could assist you to be healthy! We have collected for you the rules of healthy life style in our Health Handbook “What to do not to get ill and to stay healthy?” (copyright© DBD Centre, 2013). Without implementation of these rules do forget about good health and increasing life expectancy! Individual assessment of the risks of pathological changes based on complex (molecular, genetic, subcellular, etc) diagnostics. Regular monitoring of biomarkers systems reflecting the current state of tissues, organs and body of the investigated person (preclinical diagnostics). Prescribing individual preventive measures that enable ensuring against critical situations (diseases) development. Remember! 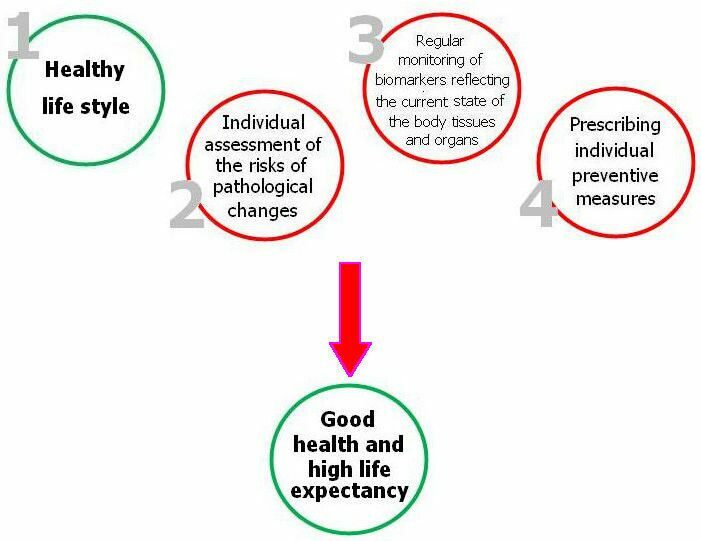 Only earliest, preclinical disease detection can conserve your health and conduce to longevity!